The orchestra meets as a class during the school day, and has 3 to 4 mandatory performances during the year and is directed by Norm Vagn. There are numerous voluntary performance opportunities for you as well if music is your thing. The RHS Orchestra participates in FOA events. We perform for Solo and Ensemble and Concert Musical Performance Assessments. Student also have the opportunity to audition for the FMEA All State Orchestra. If making music is something you enjoy, we have the group for you! If you enjoy playing a variety of music from different composers and time periods, we have the group for you! If having fun while striving to achieve musical goals sounds good to you, then you sound good to us! Players of any and all experience levels wanted! Norm was born in Chicago and grew up in Arlington Heights, Illinois. He received his Bachelors Degree in Music Education from Northern Illinois University in Dekalb, Illinois. He played bass trombone in the NIU Jazz Ensemble under the direction of Ron Modell. He received his Masters Degree in Wind Conducting from the University of Kansas. Norm taught for 10 years in McHenry County, which is an hour west of Chicago. Norm currently teaches at Riverview High School in Sarasota. He teaches orchestra, jazz ensemble, AP and Regular Music Theory and IB Music. Norm also works with the Kiltie Band. Norm Currently sits on the board of directors for the Jazz Club of Sarasota. 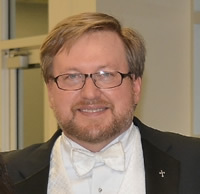 Norm has been involved in church music for a long time and is currently the Director of Worship Music at Beautiful Savior Lutheran Church.